PANELLING, CLOCK, STAIRCASE and BENCH. These pieces were removed from court room three the most spectacular of the three court rooms. Important panelling, staircase, bench and clock from The Middlesex Guildhall, in Parliament Square London which now houses The Supreme High Court, the highest court in the country with a rich legal history. The Guildhall was designed by Scottish architect James Glen Silvewright Gibson, (1864 – 1951), the building is situated opposite the Houses of Parliament, and flanked by the Treasury and Westminster Abbey. Gibson demonstrated a modern approach to his design by “keeping it quite distinct in scale and style so as to preserve its own individuality”. 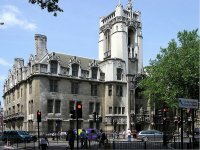 The Supreme Court building stands on the western edge of Thorney Island and was originally part of the sanctuary grounds of Westminster Abbey. The neo-gothic building started life as the Middlesex Guildhall in 1913 and housed two Courts and the offices of Middlesex County Council. As such, it is a fine example of skilfully-blended contemporary construction techniques and architecture deliberately rooted in history. The well-known critic Nikolaus Pevsner classified it as a very free interpretation of Gothic, with an almost art nouveau flavour, especially to the sculptures to the exterior. 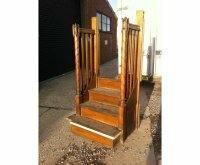 it will take you to Save Britains Heritage website where you can see the paneling, staircase and clock in situ before they were removed when the works began. The items below came from courtroom three the grandest of all the three courtrooms and was removed when The Guildhall was renovated in 2007/9. The Middlesex Guildhall and Tony Geering with the original clock he saved and returned to The Guildhall. In the third image below of the courts interior, the window to the left flanked by two oil paintings on top of the bookcase, this is the original space the clock sat when the courts were built and where it is now back in it's rightful spot. Left-hand panelling from Court Room Three, the most spectacular of the three court rooms and carved by H H Richardson. They are both very slightly curved. Height 51", Length 115", Depth at top 3 1/2". Right-hand panelling from Court Room Three, the most spectacular of the three court rooms carved by H H Richardson. They are both very slightly curved. Staircase which lead up to the Judges seats from Court Room Three designed by Henry Charles Fehr and carved by H H Richardson. Height 69", Width 31", Depth 3 1". Two small pieces of panelling from Court Room Three and carved by H H Richardson. Height 35", Length 35", Depth at top 2 1/2". A small piece of panelling from Court Room Three and carved by H H Richardson. Height 35", Length 61 1/2", Depth at top 2 1/2". Carved oak bench designed to stand on a step and carved by H H Richardson. 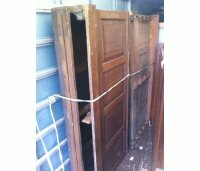 Large piece of panelling from Middlesex Guildhall. Height 66", Length 63", Depth 1". Some odd pieces of panelling from Middlesex Guildhall. SOLD back to The Middlesex Guildhall and now sit's where it was originaly designed to sit, in Court Room Three the most spectacular of the three court rooms. An Important Gothic Revival oak bracket clock from Middlesex Guildhall, in Parliament Square London which now houses The Supreme High Court, the highest court in the country and has a rich legal history that is evident in its design and decoration. 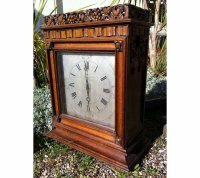 The clock was probably designed by Henry Charles Fehr and carved by H H Richardson. It is from courtroom three the grandest of them all which is written on it's original removal ticket, that is still attached to the top of the clock. At the time of construction the choice of a neo-gothic style was unusual, but the well-known critic Nikolaus Pevsner classified it as a very free interpretation of Gothic, with an almost art nouveau flavour, especially to the sculptures to the exterior.